A plumbing emergency can occur due to many reasons, some of them include clogged drains, damaged pipes and gas leaks. These can occur during any season throughout the year when temperatures and weather patterns fluctuate. Frozen pipes, backed up sewers, and gas leaks all can occur without any warning. If immediate action is not taken in time, then these plumbing problems can become detrimental to the rest of your home as well. In case of plumbing emergencies, it is advisable to take the proper steps to minimize damages. Once the water is turned off in your home it can cause pressure and hot water to rise within your water heater. If the pressure exceeds a certain limit, it could lead to bursting of the water heater that is even more risky. To eliminate any such possibility, you should turn off the unit itself as soon as you turn off the water to your home. The very first action in case of any plumbing emergency is to shut the water off immediately. It is very important to know where your main water shutoff valve is, as well as the shutoffs for various other individual appliances in your home. If the problem is caused due to any specific fixture, such as your sinks and toilets you can then turn the valve clockwise to stop the water flow. If you cannot pinpoint from where the problem is coming from, you just have to play it safe, by turning the main valve clockwise that eliminates water flow to your entire home. Once you are done with shutting the water off, you can now open the valves for all the external spigots of your home. In this manner, you can drain the pipes that would otherwise direct water into your home. The remaining water will continue to leak even if the water is turned off. You can make use of tapes, rags and buckets until a professional plumber arrives to your home to spot and assess and fix the problem. 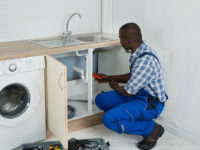 In such scenarios, it is best to get in touch with our Emergency Plumbers in Manhattan, New York who can fully diagnose and evaluate the issue. Our licensed, skilled, certified plumbers at C James Plumbing and Heating can give you multiple options for repair and/or replacement. Depending upon the plumbing problem, if replacement is the better solution, we will offer you options based on your specific need.